I stand at the end of the production line, clutching a thin slice of toasted bread in my hand and eagerly awaiting the new oil. There's something magical about autumn in Tuscany, when the scorching summer heat fades to cool and a golden hue envelops the countryside. Plump grapes are plucked from their vines and transformed into glass jugs of young, fizzy vino nuovo. At the dinner table, black truffles and porcini mushrooms appear in plates of handmade tagliatelle. It's the season for wild boar in umido, steaming bowls of ribolita and chestnuts crackling on the fire. In late October, I make the culinary pilgrimage to Castelmuzio, a tiny medieval village in southern Tuscany, perched on the edge of Val d'Orcia, a UNESCO World Heritage site famous for its stark rolling hills, Cyprus trees and endless olive groves. I'm here for La Raccolta - the olive harvest. I'm a part-time Ex Pat, spending a third of my year on a small olive farm near Castelmuzio. When I say small, I mean twenty-five trees. In a good year, I'll produce fifty liters of oil. In comparison, my farmer neighbor cultivates thousands of trees, taking more than two consecutive months to harvest. My trees take one day. There's nothing in the world like freshly harvested olive oil - thick, green and peppery enough to make your eyes water. 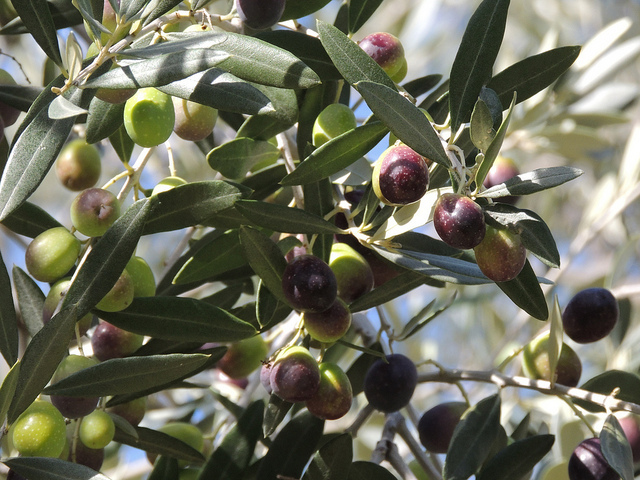 In Castelmuzio, the weather, altitude and quality of soil give the olives D.O.P. status -- the European Union's designation for a specific region, setting agricultural standards in taste and quality. In autumn, the branches of the silver-leafed trees are heavy with fruit. The olives slowly turn from green into deep purple ready to be transformed like Tuscan alchemy into liquid gold. In Castelmuzio, the annual harvest takes place from mid-September through late December. Farmers, their families, friends and migrant workers join together to cast nets and scale ladders, picking each olive by hand. Afternoons are spent at the frantoio - literally, the "olive crusher" -- turning the day's yield into olio nuovo. In the evenings, villages throw harvest festivals - dinner tables are lined end-to-end in cobblestoned streets -- with home-cooked food, live music and flowing wine. We begin in the early morning, laying large brown nets beneath the trees. My fingers tangle in the net as I walk backwards, lifting, unraveling and stretching the material. When the ground is completely covered, workers lean tall, handcrafted wooden ladders into the trees. The olive branches bend and sway against their weight, but they hold. Some of the workers scale ladders, using gloved hands and small plastic rakes to separate the olives from their branches, dropping them onto the nets. Others work from the base of the tree, picking the olives within arms reach. I stay on the ground; my arms reaching higher and higher into the branches until they ache. When the tree is bare, the nets are lifted and the olives poured into crates. We move from one tree to the next until the village church bells ring across the valley signaling the time to break for lunch. A traditional farmer's lunch is as much a part of the harvest as the picking. The workers and I squeeze around a long table in the farmer's kitchen. On the tablecloth: wicker-bottomed jugs of homemade red wine, newly harvested oil, a paper bowl of whole garlic cloves and two Dixie cups filled with salt. Across the room a fire burns on the stone hearth, where slices of thick country bread toast on a wrought iron rack. Slices of bread with charcoal edges are pulled from the fire and passed around the table. This is our daily ritual. I take a clove of garlic and rub it into the bread, watching it vanish between my fingers, leaving a sticky residue. The bread is sprinkled with coarse salt and drizzled with new, green oil. "Bruschetta" means "to roast over coals," and here -- in a Tuscan farmhouse - is the real deal. Steaming bowls of pasta are followed by a meat course - usually hearty sausages, farm-raised pigeon or pork chops grilled on the hearth. Wine is poured; stories are shared. Some of the workers have been coming to this farm for years, traveling from their homes in Sardinia and Bulgaria for the annual harvest. After lunch we return to the trees, our bellies warmed with wine. We pick olives until the sun sits low in the sky. The day's harvest is collected and driven directly to the frantoio for crushing. A frantoio is where the magic happens. Olive crushers come in all shapes and sizes. The old method of crushing olives between large stone wheels is still used in rural communities, but many oil producers opt for a modern approach, mixing machinery with cutting-edge technology. We bring our olives to Frantoio Buraschi, a one-family operation near Montepulciano -- a medieval, wine-producing town appearing recently in the "Twilight" films -- that's been producing extra virgin olive oil for 40 years. At this frantoio, the process of olive crushing is pure science. A computer-monitored cold press system guarantees the highest quality of olive oil. At first, the olives are weighed and sorted. I stand with the farmer on his truck bed, tipping crate after crate of olives into the sorter, watching them disappear down the funnel like green and purple quicksand. Inside, one machine removes excess leaves and stems and another rinses the olives before funneling them into the grinder. Once crushed, the olives rotate for twenty minutes. The pits and skins are separated and the remaining oil continues through the cold press to its final filtration phase. I stand at the end of the production line, clutching a thin slice of toasted bread in my hand and eagerly awaiting the new oil. The first drops appear; a trickle becomes a steady, green-gold stream. I pass the bread through the oil and raise it to my lips. The first bite is bold and bitter; it catches in my throat, but then the oil's true flavor comes through, rich, smooth and deep. I close my eyes and savor the taste of autumn magic in Tuscany. Throughout Italy, the annual olive harvest takes place from September through January, depending on the region. There are plenty of options - from budget to luxury -- available to travelers who want to immerse themselves in this time-honored gastronomic tradition. Here are some helpful starting points towards planning an Italian olive oil adventure. $$$$ - An Olive-Picking Vacation. Food Artisans offers an all-inclusive harvest experience, led by renowned cookbook author Pamela Sheldon Johns. This 6-day culinary program immerses visitors in all aspects of Tuscan country living, from olive picking to regional meals and visits to artisans, wine experts and cheese-makers. La Bandita, a small luxury hotel located in the rolling Tuscan hills of the Val d'Orcia offers their guests the first crack at the property's seven olive trees, and will organize day trips to harvest on neighboring farms. An agriturismo (translation: agricultural tourism) is a room, apartment or home on a working farm. Local farm-stays can be inexpensive compared to a hotel, allowing visitors an insider's view into rural living. Sometimes guests will eat with the families and participate in daily farm activities. In Castelmuzio, La Pascianella is a small agriturismo that allows their guests to pick olives by day, join the workers for lunch and even take home some of the new oil they helped to produce. Ask directions to the nearest olive crusher. Here you can watch olive oil being made and purchase just-bottled olio nuovo. Who knows, you might even make friends with a local farmer and end up in his olive grove.